After MONTHS of planning RAGBRAI is almost here! Wednesday, July 25th thousands of bicycle riders will travel from Ames to Newton and pass a short 1/2 mile from away from the Meadery. We are hoping to draw in some new friends to experience Mead. We have beer from Reclaimed Rails. Marc Bailey will start playing around 10 AM followed by Matt Woods at 1:00 PM. We have a Vegetarian Food Truck, the Veggie Thumper and Kayella's out of Montour will be serving up tacos. We are very excited to meet everyone and our bee, pictured above, will hopefully grab their attention as they travel so they make the turn and head our way. Over the past two years we have met some amazing mead makers and aspiring mead makers. 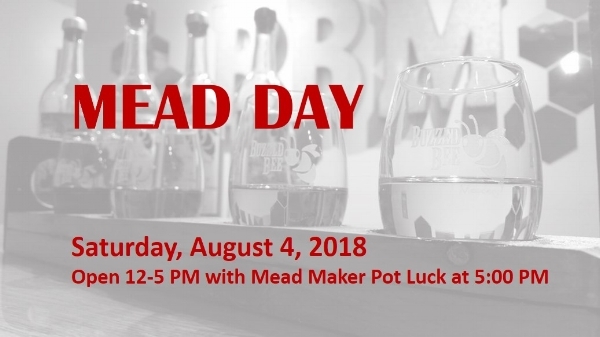 Join us Saturday August 4th for MEAD DAY. We will have a mead maker pot luck at 5:00 PM with specials throughout the day during open hours for everyone. We will be celebrating our 2nd Anniversary Labor Day weekend with Music at the Meadery on Sunday September 2nd. Jon Marko will be joining us and we are very excited to hear him platy. We will have special releases on Sunday and we hope you can help us celebrate. Check out our facebook page for details. Please keep everyone impacted by the tornadoes across Iowa this week in your thoughts. We are thinking about our friends across the State as people work through the recovery process. Be Safe and help each other.